Ready your armies, gather your forces. The Vikings are on their way, and they want to plunder, steal and burn everything in their path. You included. Welcome to the world of Bad North. Developed by Plausible Concept and published by Raw Fury, you can find this game on most platforms. Released on the 28th August 2018 for Nintendo Switch, Xbox One and PS4, this title was first released on PC on the Discord platform, and it is being released for Steam later on this year. 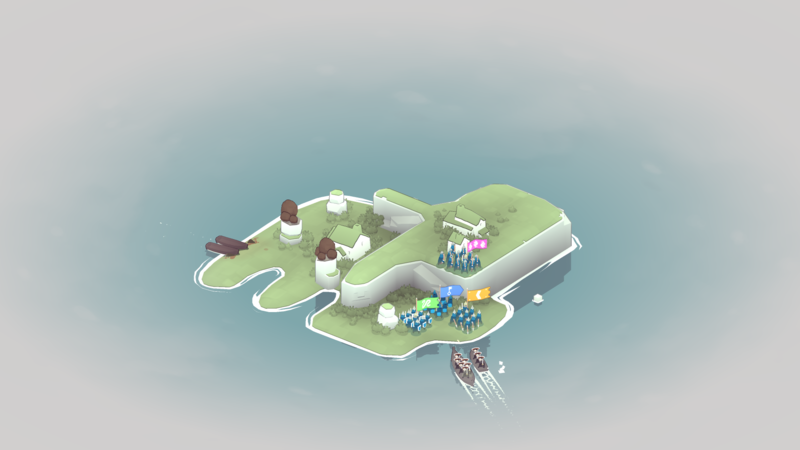 You must defend your idyllic island homes in this brutal but charming real-time roguelite adventure. Manage your defenders, upgrade their abilities and set them to the task of fighting off waves of Vikings. At the beginning, you start with a few squads at your command. Surrounded by water and fog, you see the longboats approaching from different directions. In my playthrough, I started off by scrambling my forces to the shores of the incoming invaders, swords and bows at the ready. When they landed, the slaughter began. The invaders didn’t stand a chance. Feeling good from the first few clashes, I then proceeded to run rings around the invaders, running from shore to shore and stopping any advances they tried to make. This is where Bad North exceeds at introducing the controls to you. It doesn’t have cutscenes that go on forever, explaining every little detail with scenarios. It drops you straight in with a few prompts for you to get to grips with the basics. The rest is up to you. But, it is intuitive and fun to play. 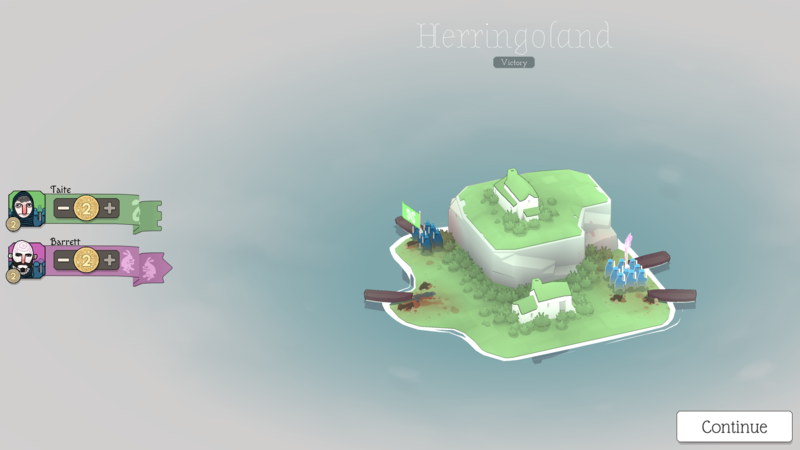 As previously mentioned, the combat is satisfying, watching your commanders with their squads run around the island battlefields, battling Vikings from all directions. The islands are laid out on a grid format, with each tile laid out around you like a game of chess but in real-time. Different elevations in the terrain can hold tremendous tactical advantages for defending archers, for example. Safe from the pointy ends of swords, they can rain death down from above to approaching longboats, thinning out the invading Vikings before they reach the shores. The more you play, the more rewards you get from the occupants of each of the islands, giving you coin in gratitude for saving their lives. These coins are then used to purchase upgrades for your merry band of troops, making them stronger, faster, and better equipped to dealing with ever growing advancements within the Viking ranks. The upgrades are easy to manage too with a shared pool of coin, and these get distributed to your troops at your discretion. You can distribute your payment to your armies, purchasing upgrades that will benefit them in the battles to come, as well as better weapons and training for your troops to make them more efficient within their roles. As the game progresses, you can find weapons and power-ups to aid you in your fight. War hammers to pound the ground for an area-of-effect smash that sends your foes flying, war horns to call aid from the islands’ inhabitants, bombs to scatter larger forces that threaten the safety of the mission. All these additions make for exciting encounters as you get to really explore how best to deploy your troops as you only get to command four troops at any one time. This really makes for fun and engaging tactical gameplay. I did touch upon this earlier, but the game has a real emphasis on the strengths and weaknesses of each unit type. Place defenders that are weak to certain types of invading troops, and you’ll find big gaping holes in your defences ready for the hordes of Vikings that follow after them. Archers are weak to close combat troops, so don’t put them on the front lines. Also, pike men are weak to archers, so don’t stand them on the front lines when you have longboats filled with enemy archers as you’ll find them with more holes than Swiss cheese. Fighters are good at defending against most troops but can be easily overwhelmed if too many forces engage against them. All of this tactical gameplay is running in real-time, so your decisions can mean swift victory or an equally swift defeat if you don’t place your troops accordingly. Also, as you progress through the game, you gain more troops to join your cause, thus bolstering your ranks. But this is also a double-edged sword. Yes, you get more troops, and you can switch between them, but the further you go, the harder the enemies become, and with harder enemies come greater chances for weaker soldiers to perish on the battlefield, so how you manage all your troops is key to victory as you only get to command four at any one time, as previously mentioned. My advice, and this seems to be working so far for me: one set of archers, two fighters and a group of pike men. All round defences for most situations from what I have played so far. 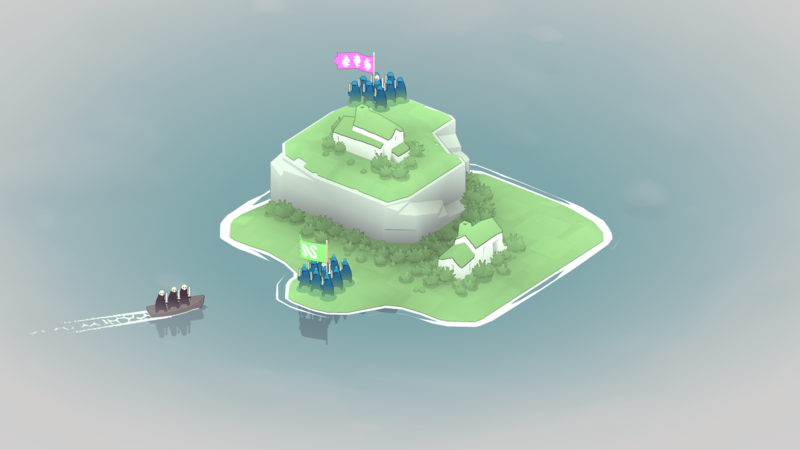 The more you explore the islands, however, the more the enemy evolves and challenges your strategies, so adapting and changing with it is key. 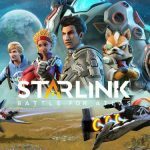 Whilst this game is extremely fun and satisfying to play with its charming visuals and intuitive gameplay mechanics, it does have a few issues that would need addressing to really polish this game off. The main ones are the camera controls. Now, with regards to the camera controls, I only have the experience with the PC not PS4, Switch or Xbox One, but I found the camera to be fixed on the centre of the island, and yes, whilst you can rotate the camera around to see from every angle, you can’t move it in any direction like you can in, let’s say, Command & Conquer games. Also, the speed in which the camera controls are measured can be distracting. Hold the A and D keys to control the rate at which the camera pans around. Quickly press the buttons and the camera zooms in 90 degree turns which, in the middle of combat, can be disastrous when planning out strategies under pressure. Like I said though, my experience is with the PC version of the game, so I do ask if someone has played this game on PS4, Switch or Xbox One to comment below and let me know if this is also the case for you and for future players. 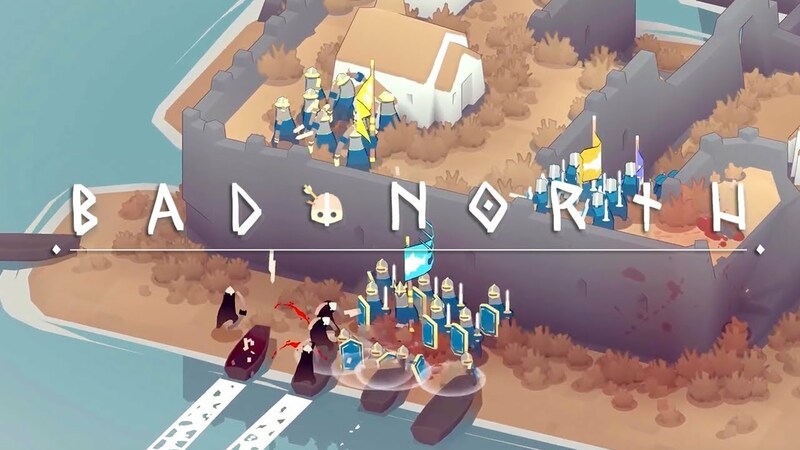 All in all, Bad North is a very fun and intuitive game that deserves your attention as the charming visuals and fun mechanics can lead to some interesting battles to be had. Each battle leads to more battlefields, where the gameplay really starts to take over as you’ll soon find yourself plotting three moves ahead to keep on top of the invading Viking hordes from across the sea. Currently, the developer is aware of bugs going on within the game and are putting patches in to repair these. 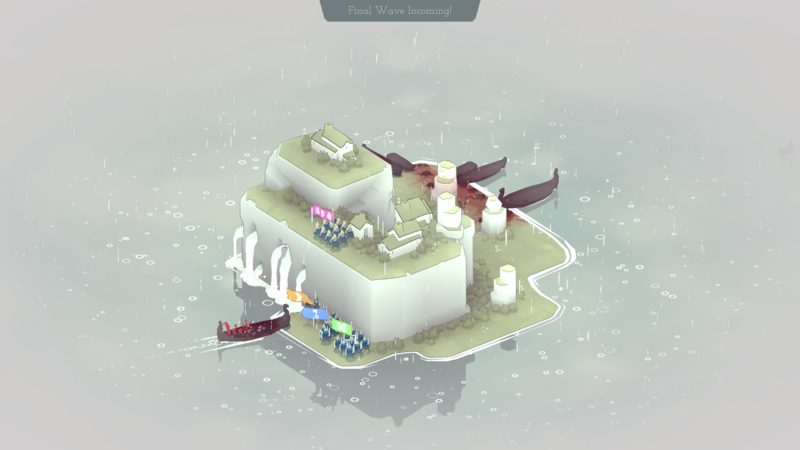 Bad North is a fantastic example of a singular concept stripped back to its purest form. Combat is tactical, engaging and has a real sense of danger to the situations you find your defenders in whilst fighting off waves of Vikings. A few minor issues but, otherwise, a recommended purchase for either long or short bursts of play. For more information on joining the Gaming Respawn team, please see our Twitter feed on the following link.